Mobile operating systems combine features of a personal computer operating system with other features useful for mobile or handheld use; usually including, and most of the following considered essential in modern mobile systems; a touchscreen, cellular, Bluetooth, Wi-Fi, GPS mobile navigation, camera, video camera,speech recognition, voice recorder, music player, near field communication and infrared blaster. Android (based on the Linux Kernel) is from Google Inc. It has the largest installed base worldwide on smartphones. In fact it is the most popular operating system for general purpose computers (a category that includes, say, "desktop" Windows and "mobile"), while Android is currently not popular regular ("desktop") PCs. Android is free and open-source software, while most commonly in actual devices, a large amount of proprietary software is bundled with it (such as Play Store, Google Search, Google Play Services, Google Music, and so on) are proprietary, licensed proprietary, closed source applications and contract (join the Open Handset Alliance) not to manufacture cellulars that replace Google applications or services. Android's releases prior to 2.0 (1.0, 1.5, 1.6) were used exclusively on mobile phones. Android 2.x releases were mostly used for mobile phones but also some tablets. Android 3.0 was a tablet-oriented release and does not officially run on mobile phones. The current Android version is 5.0. CyanogenMod is based on the open source Android Open Source Project(AOSP), it is custom ROM that co-develop by CyanogenMod community, therefore the OS does not include any proprietary apps unless the user install it. Due to it open source nature, CyanogenMod allow Android users which their device no longer gain update support from their manufacturer to continue update their OS version to the latest one based on official release from Google AOSP and heavy theme customization. The current version of the OS is CyanogenMod 12 which is based on Android Lollipop. 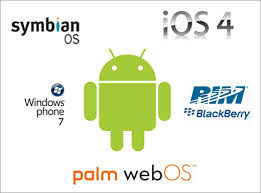 Same as it predecessor which is based on Google's Android Open Source Project(AOSP), however it included proprietary apps and it is only available for commercial uses. The current version of the OS is Cyanogen OS 12 which is based on Android Lollipop. Fire OS is an operating system launched by Amazon which based on Google's Android Open Source Project(AOSP). Currently only few devices are installed with Fire OS, which is Fire Phone, Kindle Fire series and Amazon's Fire TV. Although the OS was built on top on Google's AOSP, however it does not pre-install Google apps and ship with custom Amazon services. MIUI is develop by Chinese electronic company Xiaomi Tech, an partial closed source OS which is based on Google Android Open Source Project(AOSP). Mostly, the MIUI are install on Xiaomi Smartphone such as Mi's series and Redmi's Series, however it also has official support ROM for few Android devices. Flyme OS is develop by Meizu, an open source OS based on Google Android Open Source Project(AOSP). Mostly, Flyme OS is installed on Meizu Smartphones such as the MX's series, however it also has official support ROM for few Android devices. iOS (previously known as iPhone OS) is from Apple Inc. It has the second largest installed base worldwide on smartphones, but the largest profits, due to aggressive price competition between Android-based manufacturers. It is closed source and proprietary and built on open source Darwin core OS. The AppleiPhone, iPod Touch, iPad and second-generation Apple TV all use iOS, which is derived from OS X. Native third party applications were not officially supported until the release of iOS 2.0 on July 11, 2008. Before this, "jailbreaking" allowed third party applications to be installed, and this method is still available. Windows Phone is from Microsoft. It is closed source and proprietary. It has third largest installed base on smartphones behind Android and iOS. On February 15, 2010, Microsoft unveiled its next-generation mobile OS, Windows Phone. The new mobile OS includes a completely new over-hauled UI inspired by Microsoft's "Metro Design Language". It includes full integration of Microsoft services such as OneDrive and Office, Xbox Music, Xbox Video, Xbox Live games andBing, but also integrates with many other non-Microsoft services such as Facebook and Google accounts. Windows Phone devices are made primarily by Nokia, along with HTC, Samsung. As of 21 January 2015, Microsoft has announced that the Windows Phone brand will be phased out and replaced with Windows 10 Mobile. It will primarily aim to bring tighter integration and unification with its PC counterpart Windows 10, and provide a platform for both smartphones, and small tablets under 8 inches in screen size. BlackBerry 10 (based on the QNX OS) is from BlackBerry. As a smart phone OS, it is closed source and proprietary. It is used mostly by government employees. [dubious – discuss] BlackBerry 10 is the next generation platform for BlackBerry smartphones and tablets. All phones and tablets are manufactured by Blackberry itself. Firefox OS is from Mozilla. It is open source and uses Mozilla Public License. According to Ars Technica, "Mozilla says that B2G is motivated by a desire to demonstrate that the standards-based open Web has the potential to be a competitive alternative to the existing single-vendor application development stacks offered by the dominant mobile operating systems.